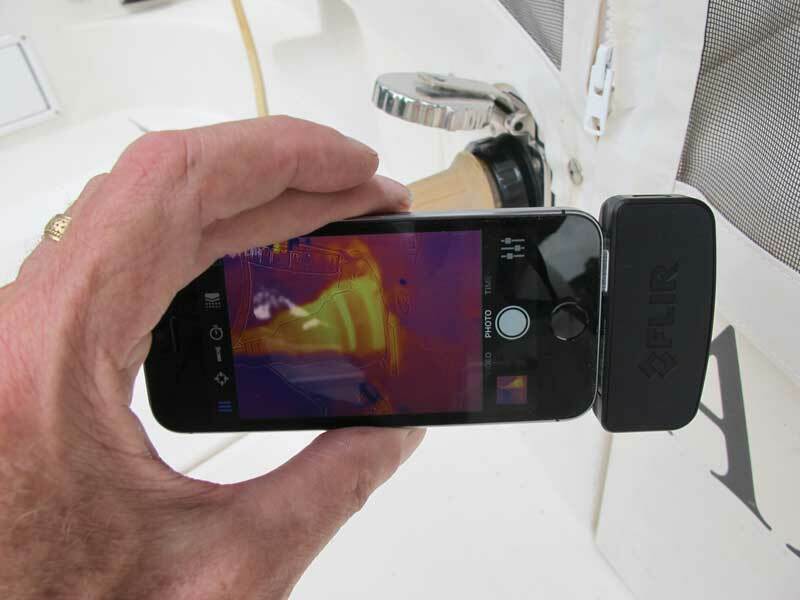 Ask the Expert: Thermal Imagery on My Boat? 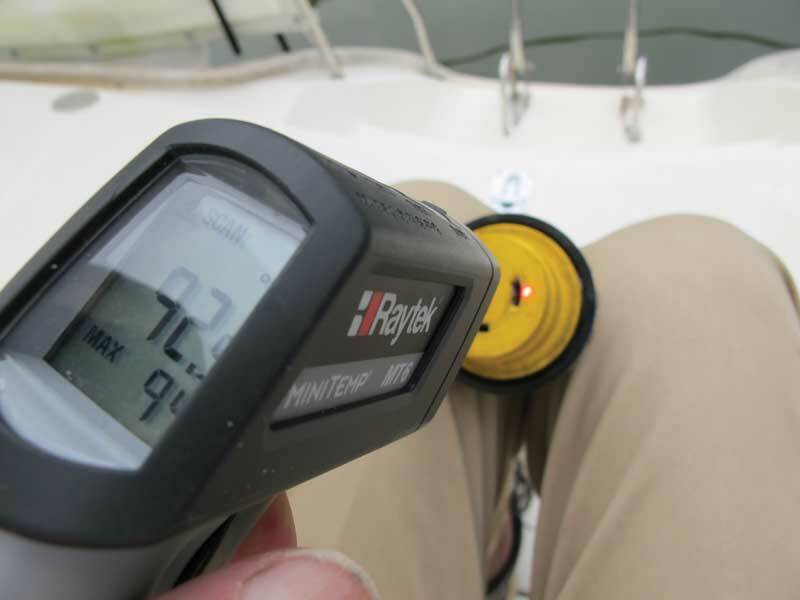 We asked Terry Slattery, a graduate engineer and bluewater cruiser who does all his own boat maintenance, to suggest an unusual—and useful—technology to help you locate potential trouble spots on your boat. He responded with a hot tip and a cool idea: thermal imagery. A thermal imaging attachment for a smart phone. Q. What is thermal imagery, and what can I do with it on my boat? A. It’s a form of digital photography that enables you to locate equipment that’s either overheating or becoming dangerously hot, from engine-related components to electrical gear. You can use it almost anywhere on your vessel. Instead of black and white or natural color, the objects that you photograph appear in color-coded form that reflects their present temperature. If your transmission shows up as yellow or white, it’s very hot; if it’s dark blue or violet, it’s cool. There are colors to represent the entire temperature spectrum. Q. Can you give me an example of how you’ve used it? A. A few months ago, I noticed that my shore-power cable seemed a bit warmer than usual, even sitting there in the hot sun. 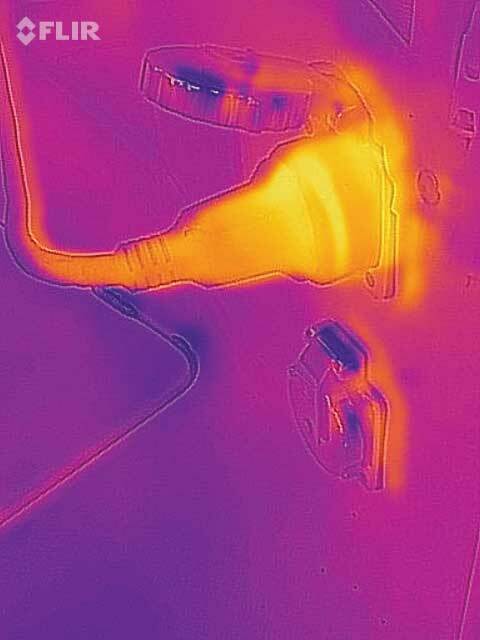 Since cables can melt or catch fire when they overheat, I decided to investigate further using my thermal-imaging camera. When I photographed the end of the cable that goes into the power outlet, it showed up as very hot (see photo): an indicator that I needed to check it out even more. Thermal imaging of a shore power cable. I took a hand-held, laser-guided digital thermometer, which tells you accurately exactly how hot an object is, and pointed it right at the hotspot that appeared in the thermal-imagery photo. I would have been concerned if the temperature had been over 200 degrees, the point at which the connection overheats and the cable begins to melt, and a serious danger indicator. Fortunately, it registered a relatively cool 92 degrees Fahrenheit. By using these thermal imagery devices, I was able to verify that I didn’t have a potential problem that could have caused a serious fire. Q. Where else can you use thermal-imaging technology? Thermal imaging also can be a big help when you’re trying to diagnose an engine problem. If you’ve noticed that your engine is running a little strangely, you can use the thermometer to check the temperature of various other components: the transmission box or the generator, for example, or even your alternator. If you’re really meticulous, you can record engine operating temperatures at several points when the vessel is running at specific revolutions per minute: idle, at cruising speed, and at flank speed. Write them down, just as you do with fuel consumption, so you’ll know what the normal range is. You’ll have a handy table that can help you tell when something’s overheating. We checked our transmission once, found it was overheating, and decided to throttle back, saving ourselves some major repairs. Alternators are susceptible to overheating (above 200 degrees) when they’re charging batteries that employ some of the newer chemistries. Using a thermal imaging thermometer. Q. Do you have to be an electrical engineer to use it? A. No. Boat mechanics and surveyors have been using thermal imagery equipment for several years, but the equipment is so simple now that all you need to make it work is curiosity and a desire to learn something. Q. How pricey is this equipment? A. Pretty inexpensive, as boating gear goes. The thermal-imagery camera is simply an attachment for your smartphone (see photo); it plugs into the bottom of your phone, and you’re all set. The cost: as little as $200. The retail price of laser-assisted digital thermometers usually hovers at around $25 or $35, but I’ve seen them for less than $10 on sale. Just go to your search engine and look for them separately. You may even discover a hot bargain.